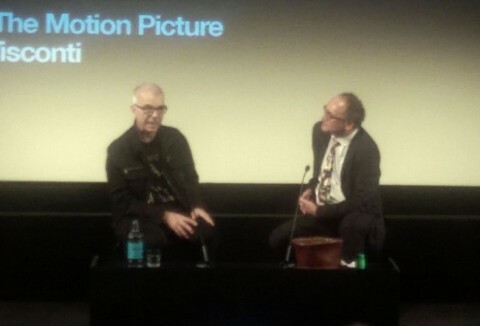 Legendary record producer, Tony Visconti was in London last night to attend a theatrical screening of Born to Boogie, the 1972 Marc Bolan/T. 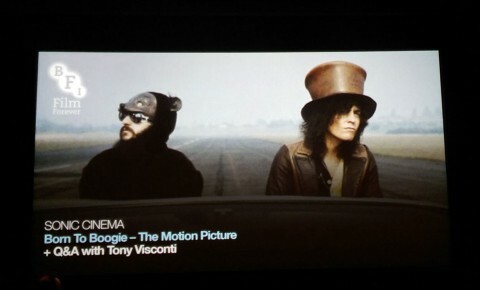 Rex concert film which will be issued on blu-ray for the first time next month. Reflecting on Marc Bolan’s success Tony said “Marc had a trick, which I analysed, having worked with him so much, and that was that in the late sixties, early seventies, people were still trying to copy The Beatles. You know, if The Beatles used a French Horn, you might try to use a Tuba. They’d do something like The Beatles, but try and get one up on The Beatles. Marc skipped a generation, he skipped a decade and went back to the fifties. He emulated – and it was as clear as day – Elvis, Little Richard, Chuck Berry, Buddy Holly… that was his trick. It was genius to go back. In other words, The Beatles had got so sophisticated, you couldn’t take it any further. They did it. They did the job well. But Marc went backwards to that era and starting doing that up, slowly. Because in our own ways, a song like Children of the Revolution, within that style of Marc’s, it was like building from the ground up with something so basic, the three, four or five chords you’d use in rockabilly, and early rock ‘n’ roll, Marc made these incredible mini-symphonies out of those chord changes. His melodies were just unparalleled. More from this Q&A will be covered on SDE in early June. Born to Boogie is issued on blu-ray and as a deluxe edition on 13 June. More on those releases here. Any idea if the Blu-ray is region free or if it’ll be released in the USA? You’ve forgotten to tag this “SaturdayDeluxe”. 29, to be precise – two weeks short of his 30th birthday! funny how the Beatles had an this effect on other artists. the only way was back. The trouble with T-Rex was he didn’t change or develop into something else. Unlike Bowie. Interesting what Tony said about Marc going back to the fifties, it’s seemed a lot of the glam artist ( not in a bad way ) did the same , Glitter Rock n Roll pt 1 , Bowie Drive In Saturday , Sweet , Elton and loads more that joined the band wagon . That was a great read Paul, wished I could have been there but I am away on my travels. For the curious, as mentioned Electric Warrior and The Slider are essential listening, and Tanx is great as well, though the slide in quality begins to show on this album. For the early pre T.Rex stuff I would maybe start with a good compilation as it is very different, but still some great music in those albums. 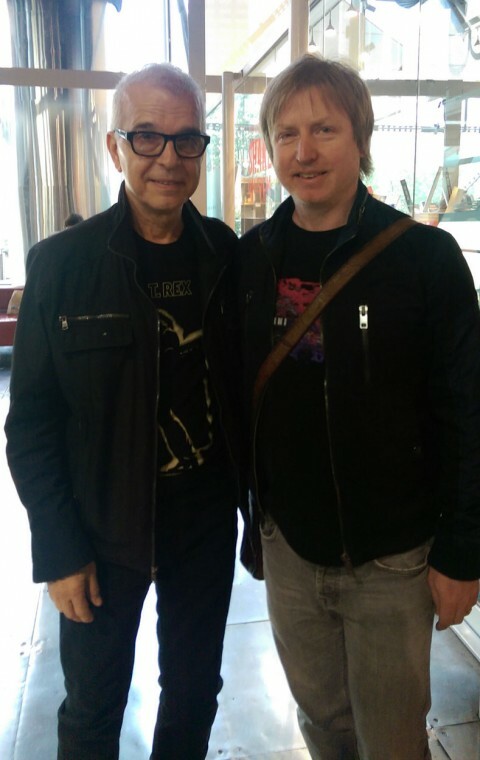 Tony Visconti is a great guy and always speaks very well of Marc. I look forward to the upcoming feature on SDE. Thanks for sharing that interesting snapshot of the evening, Paul. I would not have known about it otherwise and I’ve loved all things Bolan from the release of A Beard of Stars onwards. I’d have gone along myself if I’d been in London, as I ‘d been last Summer (an incredible 3 1/2 months during which time I saw Visconti et al cover Bowie’s The Man Who Sold the World). Last year’s For All The Cats compilation is a pretty comprehensive run through the singles, so it’s not a bad place to start. Well, if we’re talking essentials for Bolan’s peak period, you need little more than Electric Warrior, The Slider and I would even throw in Tanx. To be fair, that’s where it begins and ends for me, though. I’ve never heard the early Tyrannosaurus Rex stuff. I would start with “The Slider”. That was my introduction in -77, and it was a fantastic discovery. I have skipped over Bolan, and I can’t think of a single reason why I have done that. There is something undeniably modern about his music that survives whatever decade we are in. What is the best place to start with compilations of his? Any suggestions?